Hurricane Florence continues to be the weather headliner while the local area is likely to dodge many active tropical threats. Amazingly, higher pressure surrounding Florence will actually lead to nicer weather for the Baton Rouge area. The Tropics: The Atlantic Basin currently has three named storms and two areas of possible development. Foremost, Major Hurricane Florence poses a serious threat to the East Coast of the United States. Florence is expected to make landfall in the Carolinas as a category three or four on Friday. Initially, hurricane force winds and storm surge will be a significant threat along the coast. 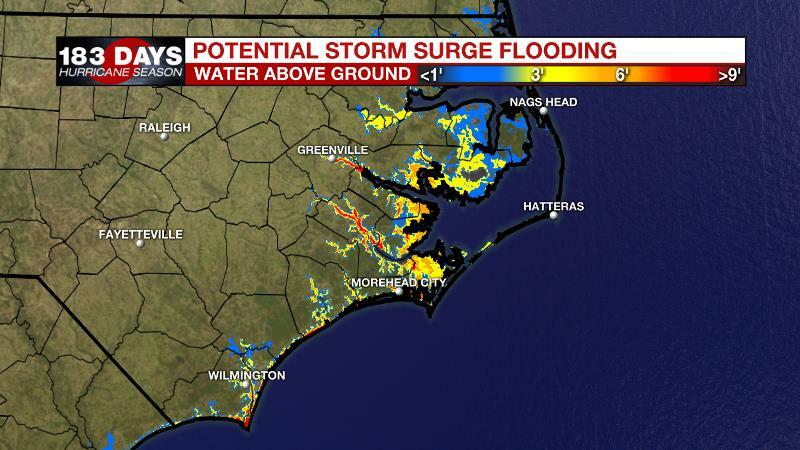 The National Hurricane Center inundation forecast accounts for a long duration east to west wind flow that will cause water to pile up as high 9 to 13 feet as the flow of the Neuse and Pamlico Rivers reverses. Beyond that, a slow-down in speed may lead a long duration of very heavy rain for much of North Carolina, South Carolina and Virginia—a region that has already seen plenty over the last few weeks. Inland flooding is a major concern. There could be rainfall totals in excess of 20 to 30 inches. 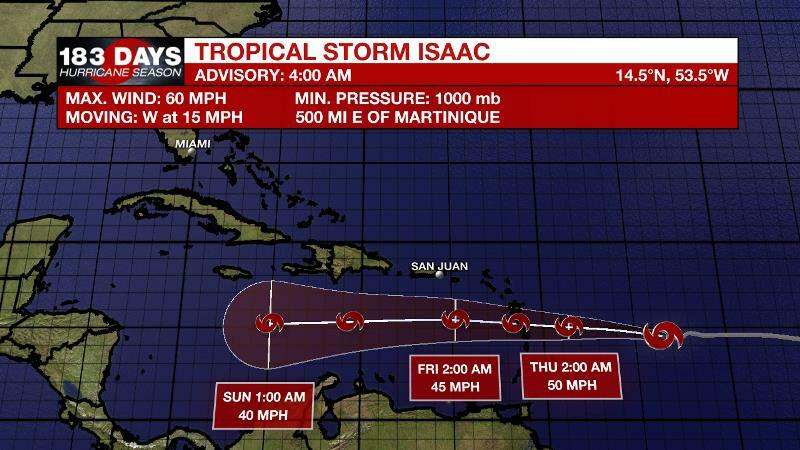 Elsewhere, Tropical Storm Isaac will cross over the Leeward Islands later this week, encountering a harsher environment in the Caribbean Sea by the weekend. Entry into the Gulf is not impossible but upper level steering winds are due west and swift, which makes it difficult for a tropical system to maintain strength. For what it is worth, American and European model guidance has this system diminishing near Central America by early next week, but this storm should still be watched. Hurricane Helene is turning north and will remain well out into the Eastern Atlantic, which is where another weak, non-tropical low is being monitored for development. Finally, an unorganized area of showers and thunderstorms north of the Yucatan Peninsula is given a 70 percent chance of development by the NHC. The window for organization is small though as this system will move westward across the southwestern Gulf of Mexico, reaching the Texas Coast by the weekend. Other than some offshore swells, local impact will be minimal. Today and Tonight: A weak front is drifting north and losing influence on the local weather. Area rain coverage will not be as extensive as Monday and Tuesday, but some isolated action will develop—especially this afternoon. Locations south and west of Baton Rouge have the best chance for a shower. Downpours and frequent lightning remain possible. Highs will top out near 90 degrees followed by lows near 73 degrees. Up Next: The active cycle will continue to ease on Thursday and Friday, as an upper level ridge brings a bit more stability to the atmosphere. Isolated showers and thunderstorms, 30 percent coverage, will remain possible during the afternoons. Less activity will allow thermometers to stride for 90 degrees again, which is getting to be above average for the time of year. Even drier and warmer conditions are anticipated into early next week as the area sits on the periphery of the remnants of Florence. An upper level trough and stationary surface front will weaken west of the area on Wednesday. As this occurs, most of the area will return to a more typical late summer regime. Widespread showers and thunderstorms early in the week will transition to just isolated activity through Saturday. A feed of Gulf moisture along the stationary front draped across central and western Louisiana will lead to higher rain chances west of the Mississippi River. 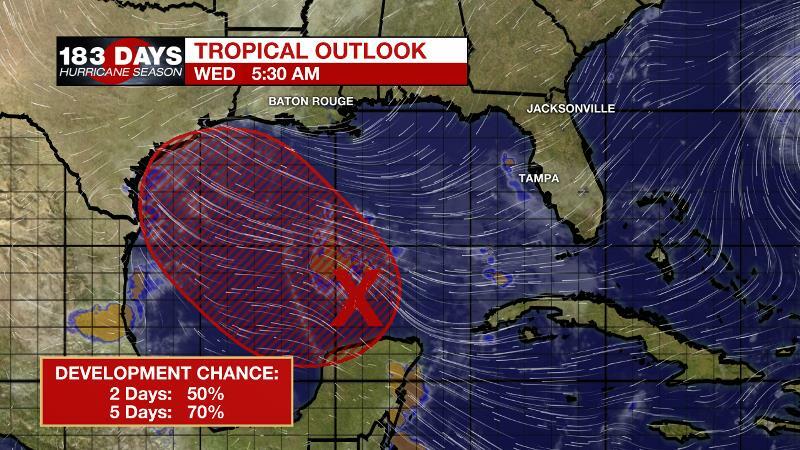 At the same time, we will be watching the south central to western Gulf of Mexico as a tropical wave could try to develop into a tropical cyclone as it moves northwest towards the Texas Coast Friday or early Saturday. Between the two areas of low pressure (Florence and the Gulf low), a ridge will develop over the interior southeast U.S. and help to minimize convective development. It is a little too early for a definitive call, but this same ridge should also help to keep Isaac away from the local area given how quickly that storm will race across the Caribbean Sea. Of course, with drier afternoons, high temperatures will be warmer and just above average in the low 90s.